Thank you for visiting! This is Rebecca Price, B.A. in Violin Performance. 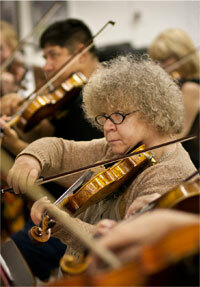 I’m a teacher of the bowed string instruments such as violin, viola, fiddle and beginning cello. I have played the violin for 50+ years, and have taught for 20+ years. I work with aspiring string musicians from beginning – advanced students with previous experience, or without any previous experience. Both private and group lessons are offered, in the studio or possibly in home. Click on music tabs above to hear me perform classical and fiddle music. My studio is located at 12296 4th Street, Apt. 4, Yucaipa CA 92399. I teach classical violin and use Suzuki and other traditional classical music methods. I can also teach folk or fiddle styles including American Bluegrass, Cajun and European e.g. Celtic, Irish and Scottish fiddle or Popular and Sacred music! See The Teacher page for basic info about me, Miss Becky. You can listen to me play these varied styles by clicking the player above! Private lessons are from 30 to 60 minutes, and groups meet for 50 minutes once a week. I include performance opportunities for my students. Please scroll down to view for info on Upcoming Studio Performances and Classes. See curriculum and schedule below, to find classes offered and our current studio schedule. Please visit my Lesson Fees page to learn about my studio fees and special offers! To schedule your free interview reach me by phone (909) 790-1613 or by Contact Me page. Again, visit The Teacher page for basic info about me. You can listen to me play by clicking the player above! Go to Testimonials page to learn more about my ratings! You can also visit my Facebook business page at Becky’s Violin Studio – Violin Lessons, Est. 1997/strong>. Every new customer receives a free interview for student and teacher to get better acquainted. At your private interview we will discuss your individual background, needs and desires and be able to start individualizing your lessons. You’ll also learn more about studio policies and activities. This interview may also include a light audition for the potential student if they have previous background on their instrument. Also, keep in mind that previous instruction and experience on an instrument is welcome, but not required as I work with beginning students as well as experienced ones. See The Students page to learn more. Becky’s Violin Studio, Est. 1997 has grown substantially over the years and has served 100’s of students! A high percentage of our clients are repeat customers or have been referred to me. I teach most ages, or approximately 4 to 84 years old currently. Again, a student’s background in music is desirable, but not required! My passion is music, whether teaching it or playing. My father was an avid classical music buff, and I learned to appreciate classical music as well as folk, country and fiddle from a young age. In fact providing a musical climate to musicians young and old greatly adds to their musical development. Learning music is priceless, for music moves your emotions, helps you to express yourself, and actually builds your IQ while listening or learning to play it. When you are thinking of music you love to hear, you could be engaged in learning to play it. If you have any questions about the lessons, studio or staff look at The Teacher page and The Students page, and of course the Testimonials page. I encourage you to call the teacher at (909) 790-1613 if you have any questions! Call (909) 790-1613 to schedule your Free Interview (required before enrollment) or to ask your questions! Beginner Mixed Age Group (ages 10 – 75), meets at my studio on Mondays from 6:00 – 7:00 pm. Class fee $80/month, $45/month for enrolled students. Many styles of music, See you there! Advanced Group (ages 10 – 75) meets at teacher´s studio Mondays from 2:00 – 3:00. Class fee is $80/month or $45/month for already enrolled students. Classical, fiddle, sacred, popular, etc.. Audition required. We are available for performance. We performed for community events, Mormon tabernacle, Centers for Spiritual Living Beaumont and Redlands, Golden Oaks Assisted Living, Braswell´s Mediterranean Gardens and studio recitals (Play Party). Studio Advanced String Quartet will be playing in November (tba) Center for Spiritual Living Redlands, and our next recital is slated for December 1, at places and times to be announced. Monday November 12, 2018 we will play at Braswell´s Mediterranean Gardens at 12295 4th Street at 6:00 pm.